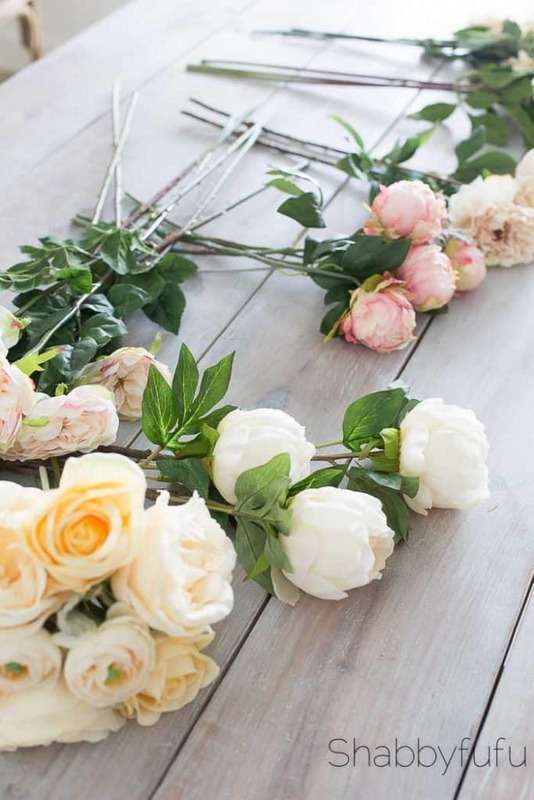 Flower styling on a budget and what you need to know to pull off a realistic look that will keep them guessing! 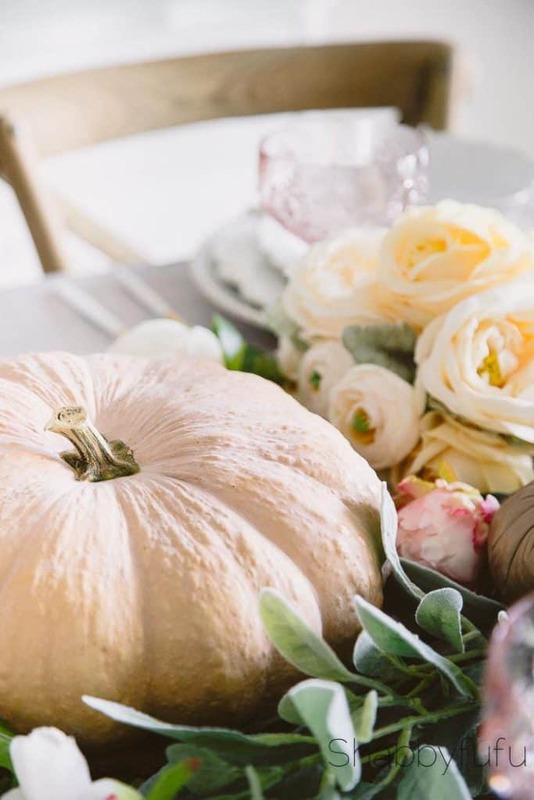 I was over at Whole Foods the other day picking up a few things and although I’m pretty much determined to not spend much this fall on entertaining items I could not help myself from purchasing one lone heirloom pumpkin. It just seemed so right for me in this soft shade of blush and was flat enough to work with just about any tablescape. But I promised to reveal my secret and that may surprise you just a bit. 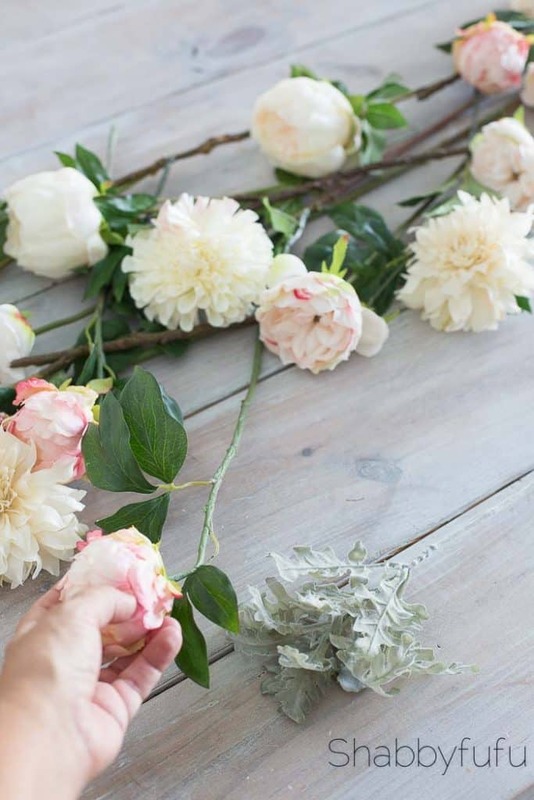 These amazing flowers…they are FAUX! I’ve been partnering with my sweet friends at aFloral and I highly suggest taking a peek at what they have to offer because the selection is incredible and the prices are reasonable. 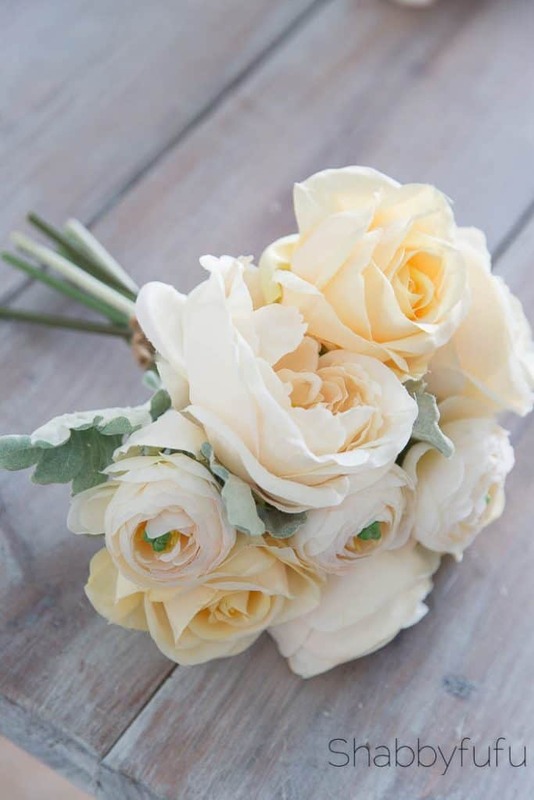 I have purchased many types of silk flowers over the years and the quality that aFloral has is top notch. 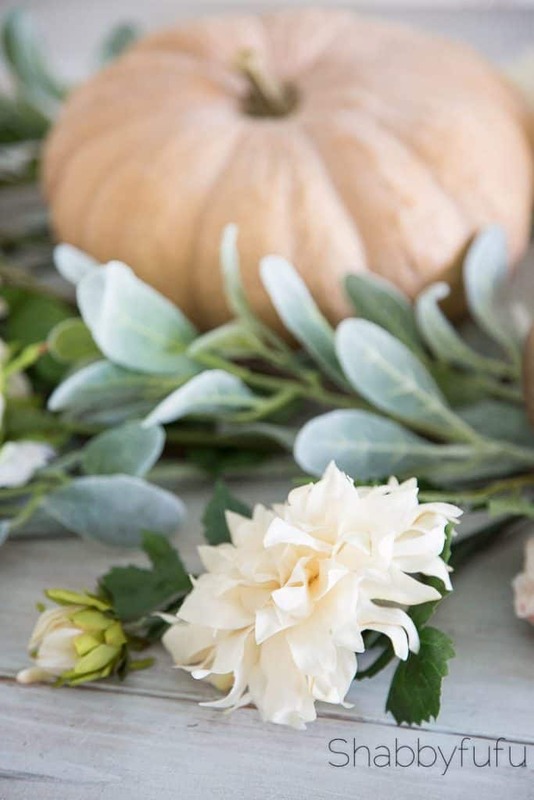 This is one of my versions of a softer side of fall…faded and pale. Let me share some tips today on how I styled this and you can create a similar look on YOUR TABLE. 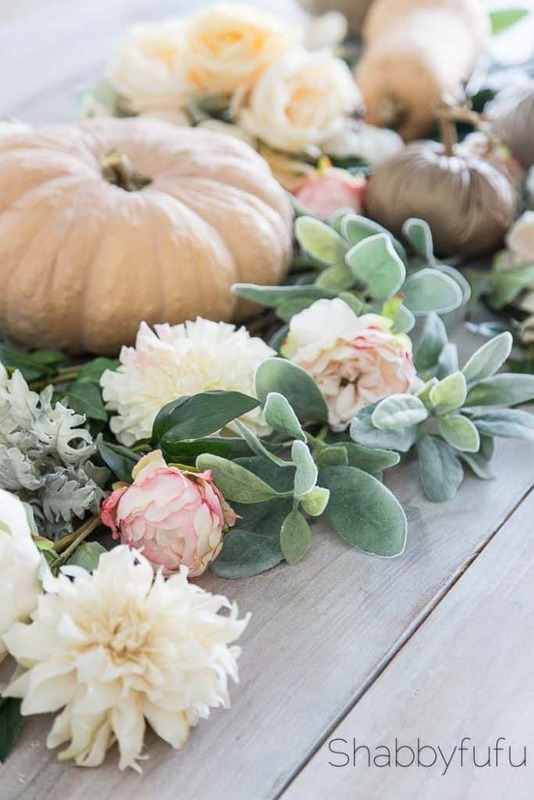 Remember…silk and faux florals are FOREVER, so do something like this on a TABLE or a SIDEBOARD and leave it up ALL SEASON long! You could even simply change out the pumpkins for Christmas balls without changing much else! I have a variety of flowers here from cafe au lait dahlias to pink peonies to peach roses, a bridal bouquet and some greenery. All are faux and all from aFloral. First I laid them out on my table to judge if I’d need some garden greenery as filler, but I did not in this case. I started laying them out down the center of the table with some of the flowers facing in one direction and a few in the other (lengthwise). Sometimes you might need to fluff out the flower heads and for a more realistic look perhaps bend the stems a little as you’d find in nature. 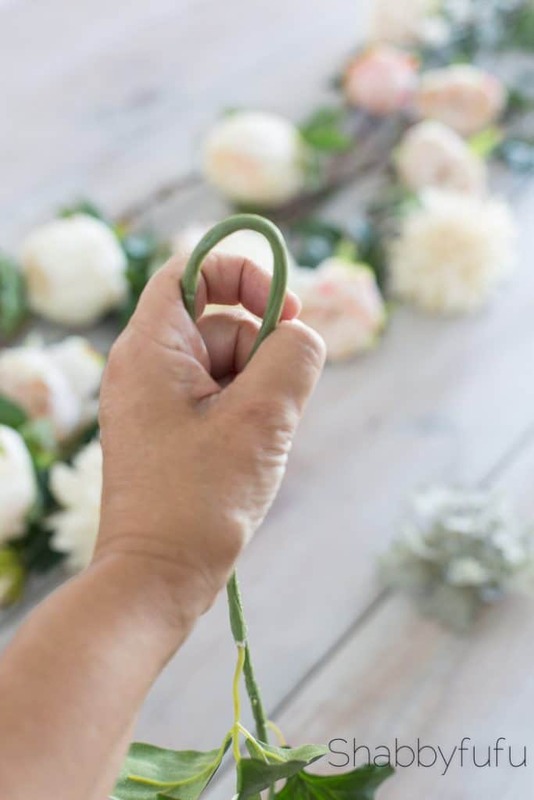 Tuck in the stems underneath the flower heads and be sure to follow along the center of the table. 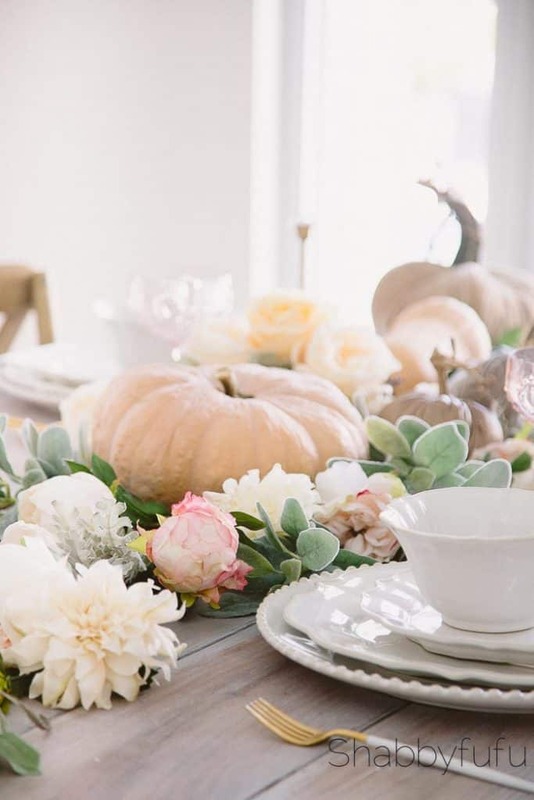 You won’t want the flowers to impede with setting the table, so keep that in mind or you can make adjustments later. This bridal bouquet was set just to the side of the large heirloom pumpkin, which I knew that I wanted in the center of the table. A bridal bouquet can also be tucked into a vase, and I’ll do that in a future table display. A few of the stems were much longer that the rest, but rather than cut them (use garden clippers if you do cut yours) I bent the ends. There is more flexibility to use your stems later if you bend them. Step back, look at your work and then fill in AFTER with the greenery. This greenery is so beautiful that it’s hard to believe it’s not real! I added the faux pumpkins afterwards and filled in any bare spots on the table with them. I had picked up a BUTTERNUT SQUASH for roasting and since the color fit in so well it’s been added to the tablescape. 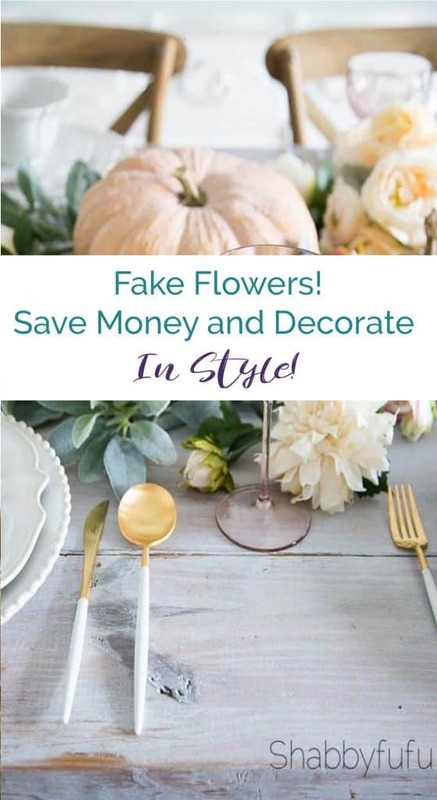 Combining real and faux is one of my favorite things to do when setting a table. The white and gold flatware is a touch of modern to my table. 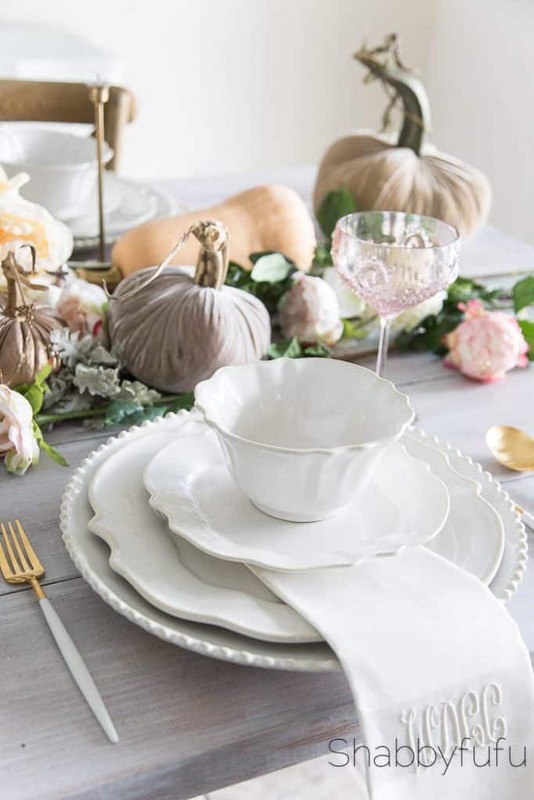 Mixed in with the white dishes it’s elegant and understated and takes things to a whole new level of pretty. 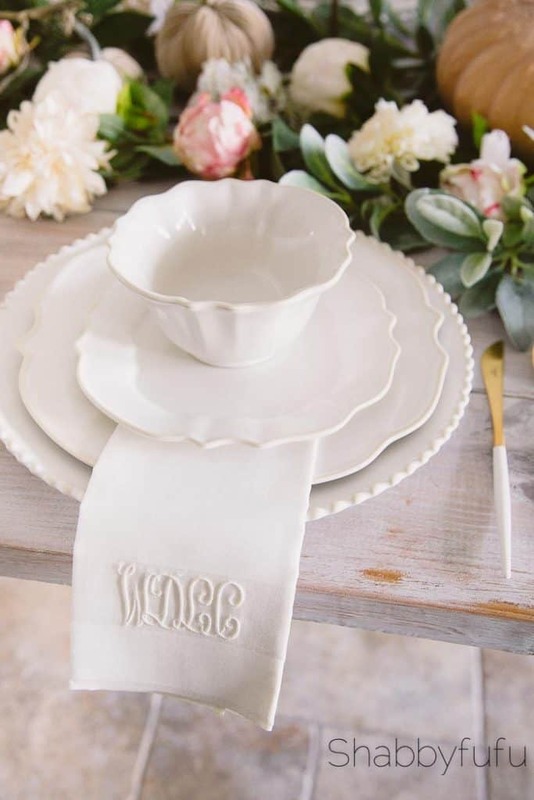 My little bit of vintage on this table is the use of the monogrammed napkins that I purchased years ago at an estate sale. I have no idea whose initials they are but it doesn’t really matter and just adds charm to the mix and the match of this soft fall table. If you’d like to see for yourself how lovely the flowers are at aFLORAL, use the code SHABBYFUFU10 for any purchase over $50. This code doesn’t expire, so save it! Please SUBSCRIBE so that you don’t miss out out and receive our free seasonal decorating guide! I am enjoying this site so much. Just my style! 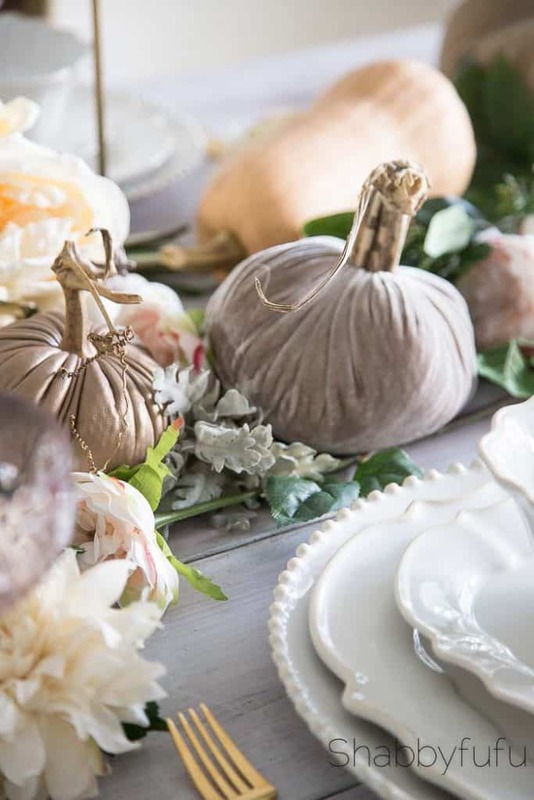 I am especially intrigued with the beautiful, pastel Thanksgiving dining table. I do pastels for all holidays and love pink! 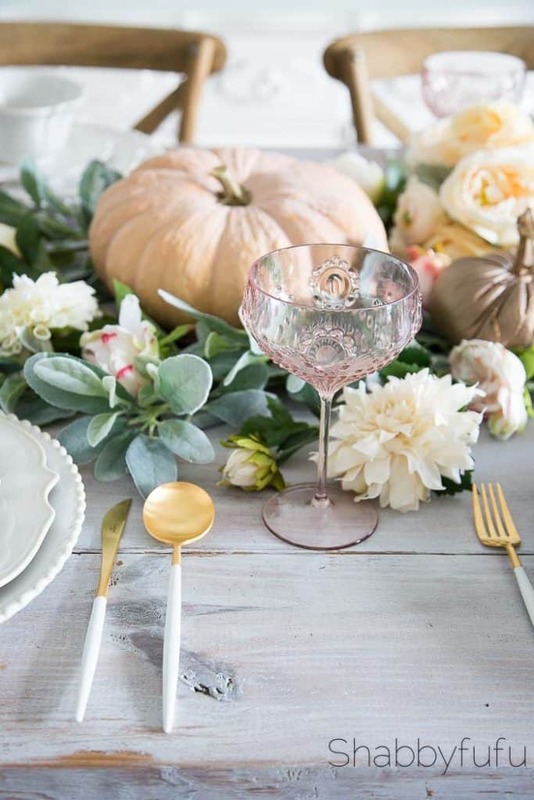 Could you please tell me where I could find the pale pink crystal wine glasses that are on the table? Theyadd so much style and femininity to the table. Hi Bradlee…thank you! They are acrylic and were from Amara, a company in the UK that I worked with.